Pong, one of the simplest video games ever created, has managed to evolve in some crazy ways over time, from the original basic 2D version and colorful Breakout sequel, to the PlayStation game with power-ups and 3D graphics, and now Cyberpong VR—a virtual reality game on the HTC Vive—where you act as the paddle instead of just moving it into place with a controller. The HTC Vive is primarily a virtual reality experience, blocking out everything around you so you only what the headset shows you, but it mixes in real world elements like your movement. The system has lighthouses that track your motions and controllers you use to interact with the games. 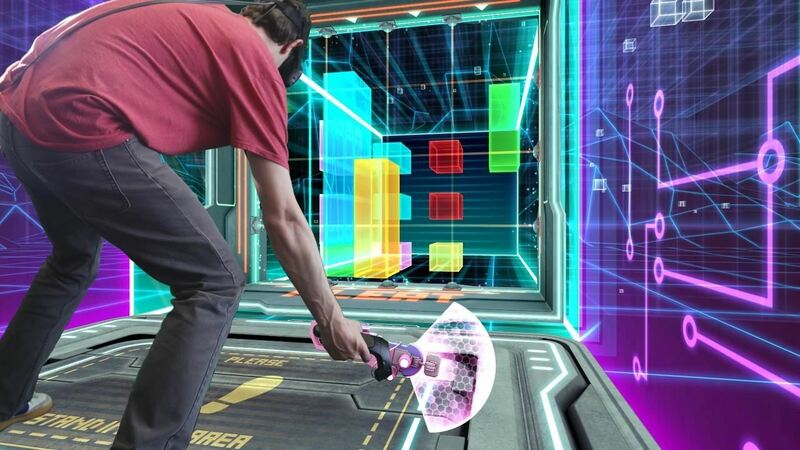 In Cyberpong, you use a controller to hit the ball back into a 3D cube that serves as a playing field. Cyberpong actually works a bit more like more advanced Pong-like games from the '70s and '80s such as the aforementioned Breakout and Arkanoid—you break bricks and can have multiple balls to contend with. While these games can feel a little frustrating and even boring at times, as they're repetitive and you're barely moving, that all changes in a mixed virtual reality environment. Suddenly, table tennis is less like a simplistic video game, and more like the sport is really is. Don't get me wrong—I loved Arkanoid as a kid, but most games were a little tedious and repetitive back then. Now, several decades later, those old school arcade games can evolve into something much more engaging. If you've got an HTC Vive and want to give it a try, you can grab it on Steam right now for under $10. Have you tryed "proton pulse" for VR cardboard ? Seeing that they must have developed a mixed reality green screen / camera rig to film these people playing the game from the 3rd person perspective is almost more impressive than the game its self. This essentially means it's a multi-player game, where one of the "players" is the camera filming the player against a green screen... with the camera's relative position being accurately tracked relative to the player and the VR world they're experiencing. Very cool.